A positive woman don't argue with the miserable because she's too busy making money. Laughter adds years to your life, if you can laugh away the seriousness of life you would realize that there's much to live for. 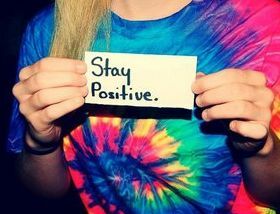 No matter how bad things may seem, never lose hope, always stay strong. Losers see hurdles in the path, and winners see a path in the hurdles. Be positive in thoughts and feelings don't doubt rather trust as give trust so it will be given back in return. The best love is one that makes you a better person, without changing you into someone other than yourself. Small beginnings lead to great Accomplishments. So start now to make the positive changes to change your world it's just by your choice! Positive thinking is talking, visualizing and expecting with certainty. Positive attitude brings in more strength, initiative and energy. Positive thoughts lead to positive actions. It gives a boost to our feelings and actions. We should determine or resolve ourselves and take right decisions at the right time and act courageously. “Even if you are on the right track, you will get run over if you just sit there “said Will Rogers. Positive actions, in return, give a lot of confidence and happiness which are essential for a contented life. Any matter remains the same and it differs on the perspective with which we view things, negative or positive. Interestingly, positive thoughts only give rise to more positive thoughts and it is a chain reaction. “Your attitude, not your aptitude determines your altitude’ said Zig Ziglar. Here are numerous quotes on positive and develop positive attitude towards life.